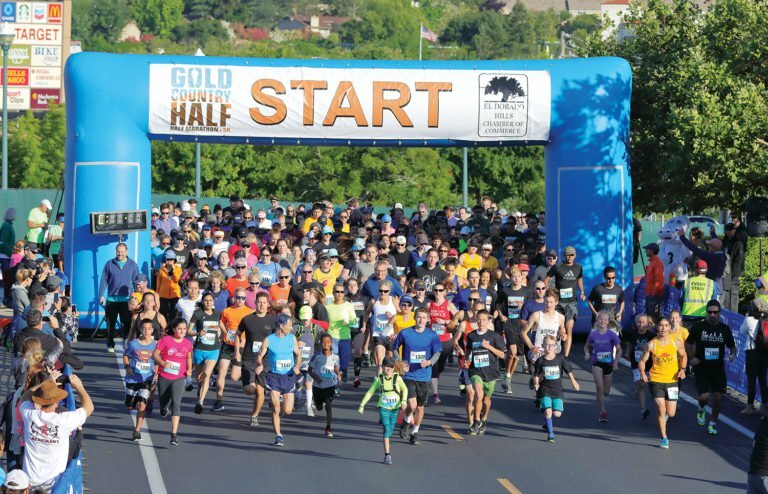 The Gold Country Half delivered El Dorado Hills’ inaugural half marathon with a combination of a strong hometown vibe and sense of community with first-class race operations and a talented elite field. Runners in the half marathon, 5k and Kid’s K gathered in the El Dorado Hills Town Center before heading out on the courses run entirely in beautiful El Dorado County. Sacramento’s Neil Klinger and Grace Gonzales captured half marathon titles and Sacramento’s Anthony Mallory and El Dorado Hills’ Hannah Hekkanen took home 5k honors on a cool Sunday morning. More than 1,000 runners participated in the event, organized by the El Dorado Hills Chamber of Commerce and managed by the Sacramento Running Association (SRA). The half marathon course featured some rolling hills but race organizers focused on keeping the route along the valley floor and as flat as possible. Klinger, a HOKA Aggies athlete, covered the 13.1-mile course in 1:11:41, nearly five minutes ahead of the competition. SRA Elite athlete Jesse Barragan (1:16:12) and Stockton’s Cesar Ortiz (1:16:19) rounded out the top three on the men’s side. “There was a head wind for a good part of the race and I got a cramp for about two miles, but it was a good race,” said Klinger. Gonzales, of SRA Elite, delivered a strong performance for the win in the women’s half marathon with a 1:25:26 effort. SRA Elite teammate Megan Oldenburger (1:28:27) and El Dorado Hills native Hayley Floyd (1:31:24) took home the next two spots. “This is just my second race in five years after taking some time off after college and I have only been running with a structured training plan for about a month. SRA Elite’s Mallory covered the 5k course in 16 minutes and 18 seconds, six seconds ahead of runner-up and SRA Elite teammate Jedidiah Soliz (16:24). Duncan Reid was third in 16:44. “It was good to try something a little different. Thirteen year-old Hekkanen delivered a strong performance in the 5k with a 21:09 finish. Hekkanen’s former coach and Shingle Springs resident Allison Orofino (21:13) and Teresa Mallory (21:38), sister of Anthony, finished second and third, respectively. Hekkanen, the soon-to-be St. Francis High School freshman, gave the hometown crowd something to cheer about as she came across the finish line. Many local businesses had a strong presence in the finish festival where runners mingled and enjoyed food, beer and fun post-race. Strategic race partners Gold Country Run + Sport and the El Dorado Hills Fire Department and the official charity beneficiary 3Strands Global Foundation, an El Dorado Hills-based non-profit organization fighting global human trafficking, were integral in helping execute the inaugural event. SRA events include the recently completed Gold Rush 50k, the Capital Cross Challenge on Oct. 7, the Run the Parkway on Nov. 4, the 35th annual California International Marathon on Dec. 3, the Super Sunday Run on Feb. 4, 2018, and the Credit Union SACTOWN Run on April 8, 2018.